Looking for a place to have snack time and playtime that is creative and imaginative? 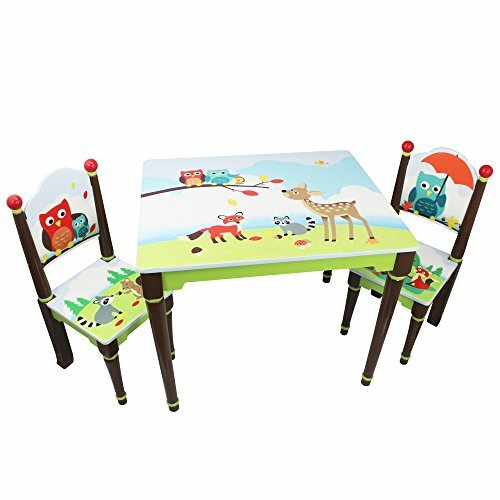 The Enchanted Woodland Table and Chair set offers your children in escape into the woods and their most creative dreams. A beautiful hand sculpted, painted and carved mural of cute woodland animals such as deer, foxes, owls, and raccoons decorates the table top. Friendly owls play along the seat backs of the chair and their friends dance about the chair seats. Hand crafted from wood and hand painted with love, your children will rant and rave about finishing their studies on this piece! Additional Set of 2 Chairs Set sold seperately.